The UltraSling IV three-point strapping system is easy to put on, while its unique design eliminates pressure on the neck, leading to increased patient comfort and compliance. The soft, breathable inner lining with mesh laminate helps improve ventilation. And, a new, contoured cushion provides the needed abduction while relieving pressure on the ulnar nerve. 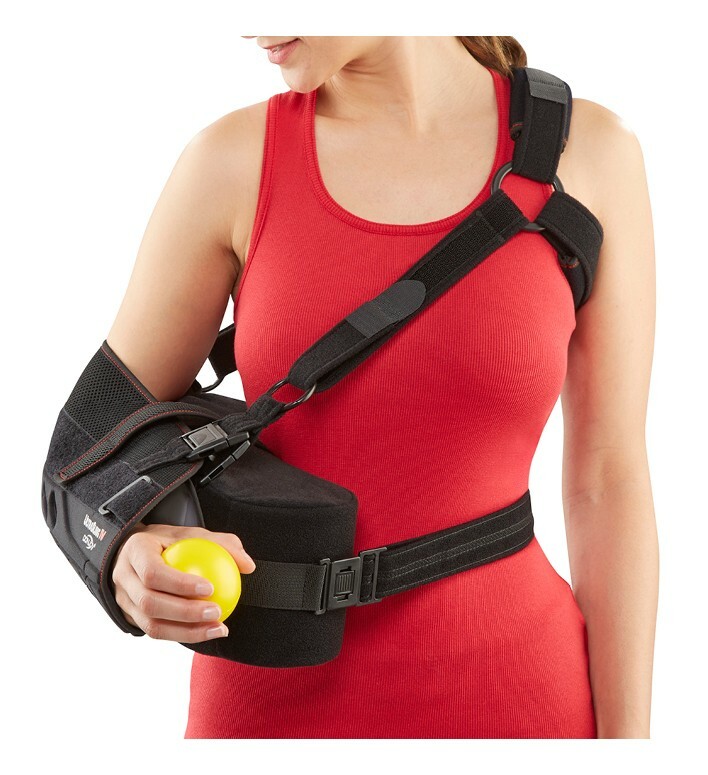 Is the sling strapped to the pillow, so that if I bend forward my arm will not move forward? Can the IV strapping be purchased for the III sling? I had ORIF surgery and will be in a sling for 12 weeks. How do I choose between an ultrasling II, III or IV? Doctor orders are rotation OK up to neutral. The only differences betwenn these slings are material and strapping. The Ultrasling II has a cotton material in the sling, we had complaints of it being too hot so the Ultrasling III was made with a mesh materila in the sling for more ventilation. Those two slings have the same strpping over the opposite shoulder across the back to your waist. The Ultrasling IV has the same material as the III but the strapping system is a loop around the opposite shoulder to take pressure off the neck. All fot the slings come with a 15degree abduction pillow and will not rotate you shoulder at all. When I measure my arm as described it is 13&3/4 inches but I have a very large upper arm would I need to order a large or extra-large? Can the sling be washed and if yes how. All of our braces and supports can be hand washed in a mild detergent and air dried. You can just seperate the sling from the pillow and wash the sling then when it dries attach back on the velcro of the pillow.